The King is here: Welliton celebrates one of his four goals against Al Nasr. Sharjah striker Welliton has heaped praise on twin summer arrivals Ryan Mendes and Igor Coronado, crediting them with the strengthening the ranks of a side who have been perennial underachievers in recent years. The King are one of the most successful clubs in UAE football history – having won the Arabian Gulf League five times (fourth most) while they jointly hold the record for President’s Cup triumphs (eight) with Al Ahli (now Shabab Al Ahli Dubai). But the King’s crown has fallen in the last two decades – they have not won the President’s Cup in 16 years, while league title glory has not been tasted in 23 years. But Abdulaziz Al Anbari’s men have begun the 2018/19 AGL season on fire – rocketing in 10 goals in their opening two games. They put four past Al Dhafra on the opening day and followed that up with a 6-3 demolition job on much-fancied Al Nasr on Saturday. Brazilian striker Welliton helped himself to four of those goals – netting a 27-minute first-half hat-trick – but shifted the focus onto collective rather than individual success. “I enter every game and my goal is to contribute to the team’s win,” said the nomadic 31-year-old striker, who with five goals in two games is just two strikes behind his 2017/18 total of seven from 19 outings. Sharjah finished sixth last term – their highest place since returning to the top-flight in 2013 – and their bright start to the campaign has raised hope of even better this year. And Welliton believes Cape Verde international Mendes and Milton Keynes Dons academy graduate Coronado have greatly improved Sharjah. “The presence of Ryan and Igor helped to strengthen the offensive side in addition to the national elements in the team,” added the former Spartak Moscow man. “I thank the players for their efforts and cooperation with me, and my record of four goals is the collective efforts of my fellow players and the coaching staff during this early period. “The victory (against Al Nasr) is just three points in the league and we still have everything to do. The next games are difficult and we need to support everyone. Al Ain boss Zoran Mamic has repeated displeasure with the UAE set-up after his ill-prepared and “not happy” international contingent labored to a trying 2-1 win against Al Dhafra. A total of seven Boss players were selected by the Whites for this month’s 2-0 loss to Trinidad and Tobago and 3-0 victory against Laos in Catalonia. All of them were, at least, named in the match-day squad for Saturday’s Arabian Gulf League-resumption, in which veteran substitute Ibrahim Diaky’s late double secured victory for the out-of-sorts champions. This poor performance reopened wounds from August’s Arabian Gulf Super Cup loss to Al Wahda. Arguments had opened up then about the involvement and use of Al Ain stars in a three-week training camp in Austria. “I remember the first half for Al Ain in the Arabian Gulf Super Cup that took place in Cairo at the beginning of the season,” said Mamic, whose side went 3-0 down before eventually suffering heartbreak in a penalty shootout. “The international players had just returned from the national team camp and the first half compared to the one today [against Dhafra]. “When the players return, they appear bad. “The players are generally not good and they are not happy, needing time to adapt to the team. “They lack the required elements of speed, fitness and energy. They did not participate in the matches as required. “Mohamed Ahmed played only five minutes, Ahmed Barman played 10 minutes and Mohamed Abdulrahman 20 minutes. Mamic had been forced to distance himself last weekend from reports linking him to replacing under-pressure tactician Alberto Zaccheroni at the helm of January 2019’s Asian Cup hosts. With his mind back on club duties, special praise was reserved for the continued influential role performed by 36-year-old midfielder Diaky. Mamic said: “Diaky is a professional football player who can make a difference at any moment. “For any player of his age, it is difficult to play the roles he is assigned to on the pitch. What he presented is a lesson for the team’s young players. 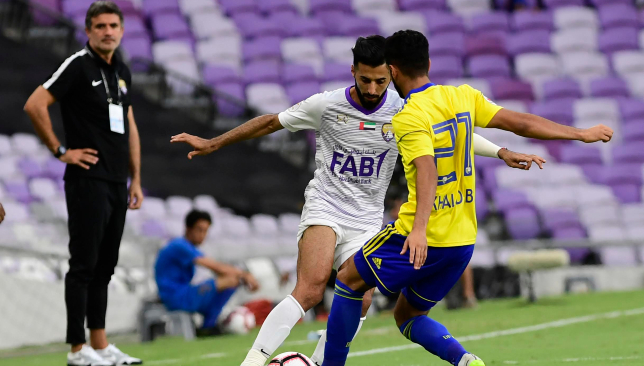 Al Ain’s title defence continues on Friday at an Al Nasr side who’ve conceded seven goals in two shock top-flight defeats. 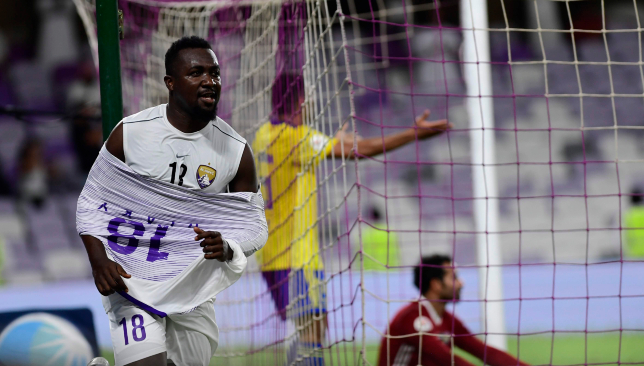 Veteran substitute Ibrahim Diaky showcased his enduring value to Arabian Gulf League-champions Al Ain on Saturday when a late brace off the bench earned a come-from-behind 2-1 win against Al Dhafra. 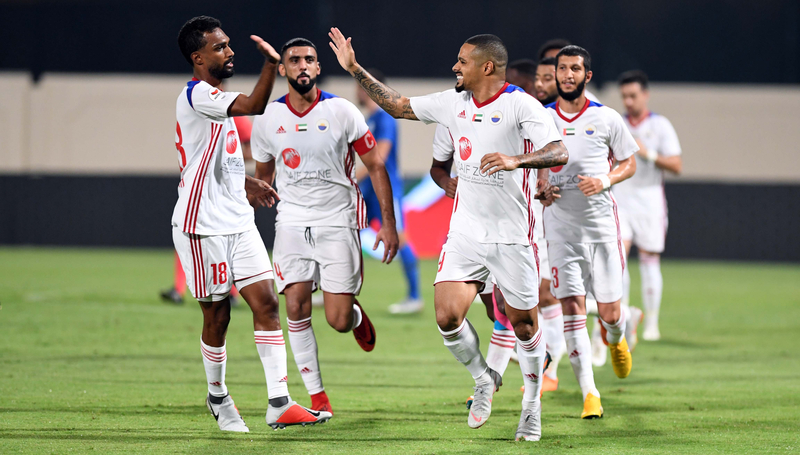 The visitors to Hazza bin Zayed Stadium got off to a flying start when ex-UAE forward Ahmed Ali stroked a composed shot into the top corner during the ninth minute. In the absence of Sweden No9 Marcus Berg, who was a late withdrawal through illness, the title holders initially failed to live up to their vaunted billing after the international break. A damaging defeat appeared on the cards, prior to Diaky’s game-changing interventions. The 36-year-old midfielder first connected with Egypt international Hussein El Shahat’s low centre with less than 10 minutes remaining. He then capitalised on a defensive error on 87 minutes to head into an empty net on 87 minutes. Meanwhile, 10-man Al Jazira survived a late scare against promoted Fujairah to earn a thrilling 3-2 triumph. Brazilian forward Leonardo finished with aplomb on 37 minutes for the hosts at Mohammed bin Zayed Stadium. Soon after the interval, UAE goalkeeper Ali Khaseif was dismissed for a late challenge. But this didn’t stop Whites predator Ali Mabkhout’s controlled shot and goalkeeper Saleh Rabee own goal from making it 3-0. Algerian forward Mohammed Beneyttou lashed in from close range on 87 minutes and then won a penalty that he converted, but these interventions came too late in proceedings. Meanwhile, coach Jose Luis Sierra earned his first Shabab Al Ahli Dubai Club win as Ajman were downed 3-1. Defender Mohamed Jaber’s scrappy goal opened the scoring just before the break for the vaunted visitors to Rashid bin Saeed Stadium. But the hosts levelled soon after the interval through Morocco midfielder Adel Hermach’s calm finish after another penalty-box scramble. Shabab Al Ahli were undaunted, however, and fierce efforts from summer additions Emiliano Vecchio and Jaime Ayovi sealed the victory.